A Tory government minister has set up a Change.org petition to protest against cuts to the funding of local Staffordshire bus services that are being made by his local Tory council as a result of the massive unprecedented local government funding cuts being imposed by the Tory government he's part of. The Tory MP in question is Theresa May's darling and spectacularly under-qualified Defence Secretary Gavin Williamson, and he really doesn't seem to have a clue. Instead of setting up a petition on a website that absolutely nobody is obliged to take account of, he could actually use his position in government to pressure his colleagues to reverse their ruinous campaign of local government funding cuts. Not many people understand how severe these ideologically driven Tory cuts to local government budgets are, but Williamson has no excuse for ignorance because he's a member of the political party that voted to approve them, and a member of the government that is currently implementing them. The Tory fixation with ruinous austerity dogma means that they're already cut the local government budget by 67% since they came to power in 2010, and they're planning on slashing even more in an effort to reduce the Department for Communities and Local Government budget from £12.9 billion in 2015/16 to just £5.3 billion by 2020. It's the usual Tory way to ensure that by far the heaviest cuts land on non-Tory councils (Labour, Lib-Dem, SNP, Plaid Cymru) but when they're slashing local government budgets by an extraordinary 67%, there's no way that Tory councils won't end up feeling some of the bite too. In fact the Tory run Northamptonshire Council was the first to go slump into de facto bankruptcy when they admitted in February 2018 that they're unable to meet their financial obligations. Yet the austerity dogma driven Tory campaign of cuts to local government funding continue regardless. This extraordinary campaign of Tory austerity cuts is the most fundamental reason that local councils all over the UK are slashing funding for local bus services; failing to provide social care to the elderly; closing libraries, swimming pools, leisure centres, and countless other local services; flogging off public property and infrastructure to speculators; reducing bin collection services; dramatically scaling back highways maintenance; barely cutting the grass in summer; taking ages over planning decisions because they've laid off so many planning staff; closing all their public toilets; and teetering on the edge of total bankruptcy. 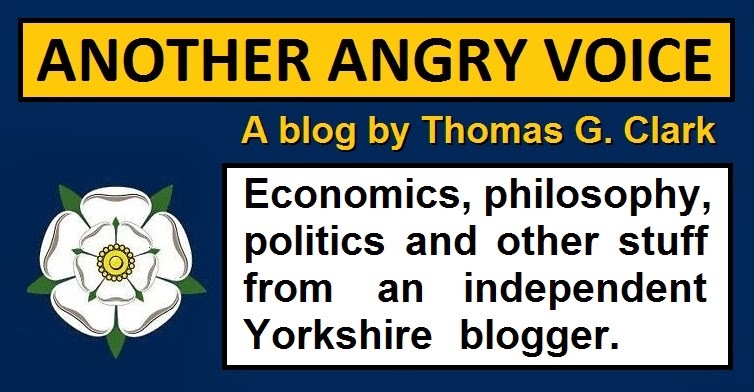 The truly sad thing is that many people are so politically disengaged/under-informed that they don't even realise that the crucial reason their local services have deteriorated so dramatically (while their Council Tax bills are actually rising) is the continuing Tory fixation with ruinous austerity dogma in central government. 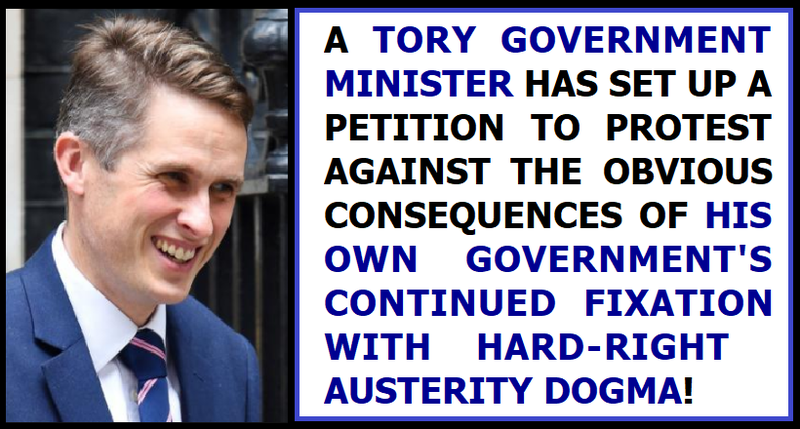 Yet this odious Tory squit who has backed this unspeakably destructive campaign of ideologically driven austerity fanaticism to the hilt is setting up a petition to pretend that he's actually a good guy who cares abut the delivery of local services! And it's beyond doubt that a load of gullible Tory voting drones in Staffordshire will fail to spot the trail of causation that flows directly back to the Tory government's fixation with austerity dogma, and they'll continue to vote Tory at the local level. And come the next General Election they'll continue to vote for economic vandals like Gavin Williamson to continue pushing their devastating hard-right austerity dogma in central government, even as they chunter on about the massive deterioration in their local government services. All we can do about it is to try to counter their economic ignorance and party political tribalism by campaigning as hard as possible against the Tories in areas where there's a chance of beating them, so that we can put an end to their ideologically driven and endlessly self-defeating campaign of social and economic destruction and begin investing in our country again before it's truly too late to reverse the damage.